The first segmented ring holds all three, primary, secondary and tertiary colours. It was with much pleasure and delight that I worked for the Buderim Calligraphy Group on the weekend. I ran a split-colour palette workshop with the "Ford Colour Wheel". I call it the Ford colour wheel in tribute to my tutor at the ANU School of Art. The beauty of this colour wheel is that not only do you mix the primaries, secondaries and the tertiaries you learn to mix the stunningly beautiful chromatic greys and draw them out with water ... there really is something about colour which just grabs you! 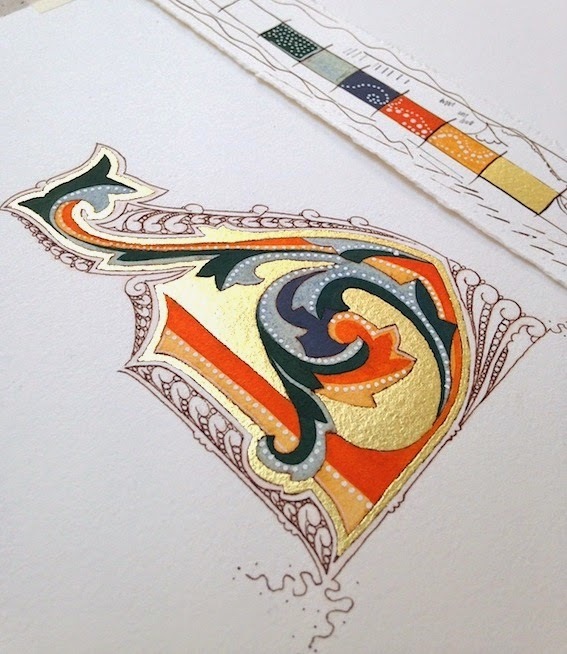 Whether you love soft pastels or striking vivid colours, warm or cool colours just experimenting, researching and developing a palette is soul rewarding. The class was divided on their choice of first colour wheels, almost half and half, warm to cool. It was good for observation purposes. Thank you Buderim Calligraphers for inviting me to teach three times over the past ten months. Your support has been much appreciated. Love the camaraderie and the superb shared lunches! gemma I wish I could have been a fly on the wall - your colour wheel is a work of art in itself! Thanks young one! I have many comments to make re. your article in the Colophon ... a real beauty which hit my desk yesterday from UTAS School of Art and how they only have "academics" teach for them. They couldn't possibly have calligraphy being taught there!!! !No adult eucation program at UTAS either. Will put it all in email to you. 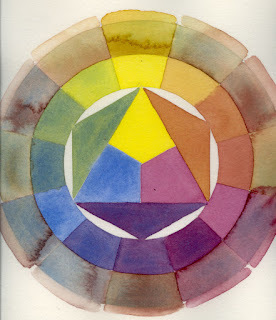 A worthwhile exercise is to create four colour wheels one each cool & warm in watercolours and one each of warm and cool gouaches ... great experience ... specially the chromatic greys. Am at Brisbane international airport, off to NZ for colour collage & calligraphy workshop. I am excited about this trip and the class. Have promised you lots, once settled in Tasmania I'll have time to be ... well frankly "just me".